The 23.8 cubic foot LG LTCS24223S is a great choice for anyone who needs to store a lot of food, doesn't want to pay a premium for a French-door style fridge, and has the space for this big boy. It comes in four color options to match any décor. Almost fully-featured. Although the shelves and drawers on the LG LTCS24223S don't offer a lot of adjustments, there is enough overall space that you probably won't need to worry about that anyway. Organizational options include two full shelves, two crispers (with a full shelf on top) and two storage bins in the fridge door that can accommodate gallon-sized jugs. There's a butter compartment as well, but we saw several complaints that it's too small to hold a tub of margarine, so if that's where you like to store your margarine, you probably won't be able to. There is also an icemaker, and the freezer has LED lights along the side that are very popular with users. The one thing the LTCS24223S is missing is a water dispenser, so, if that's important to you, you may want to take a look at the Kenmore 79433 (Est. $1,780) instead. It's pricier (although you can usually find it on sale for less than $1,000), but its design is based upon that of the LG LTCS24223S and it has an interior water dispenser. Some quibbles about consistency. Pretty much all of the experts agree: the LG LTCS24223S is an average performer when it comes to freezer temperatures, both in accuracy and consistency, but does well with refrigerator temps. At Consumer Reports, the LTCS24223S earns scores of Very Good for thermostat control and Good for temperature uniformity. Still, it's one of the only larger top-freezer refrigerators they recommended, most of the other recommended models are smaller, 18-cubic-foot refrigerators, which might not be large enough for the average family. At CNET, Ry Crisp names the LTCS24223S the best top-freezer fridge. He finds that the refrigerator temperatures are consistent -- hitting and staying below 40 degrees Fahrenheit. It's only in comparison to other fridges (but one that less energy efficient, and another that's a bottom-freezer style), that the LG lags. As Crist notes, "…it didn't necessarily disappoint, the LTCS24223S fell short of my expectations." Kori Perten at Reviewed also dubs the LG an average performer in that regard, saying, "The refrigerator compartment boasts relatively consistent temperatures over time and throughout the cavity, but the freezer struggles with consistency." Users, however, are more complimentary and say the LTCS24223S is great at maintaining temperatures in both the freezer and the refrigerator. A couple of owners say the freezer compartment seemed a little warm to them, so they just turned down the temperature: problem solved. Very efficient, especially for its size. The LG LTCS24223S is an Energy Star Certified refrigerator that does well in professional tests too, earning an Excellent for energy efficiency at Consumer Reports. Its estimated operating costs are about $60 per year. This makes it one of the most energy efficient top-freezer refrigerators for its size, something that both Crist at CNET and Perten at Reviewed note with approval. Big footprint; plenty of finish options. With 23.8 cubic feet of space, it's obvious that the LG LTCS24223S is one of the biggest top-freezer refrigerator models around. Be sure you measure your available space; it's quite possible that it may look overwhelmingly large if you have a smaller kitchen. It measures 33.38 inches deep by 68.5 inches high by 32.75 inches wide. Both experts and owners praise the LG LTCS24223S for its sleek, attractive styling; most love the pocket handles that replace the standard pull handles and give this fridge a sleek, modern look. 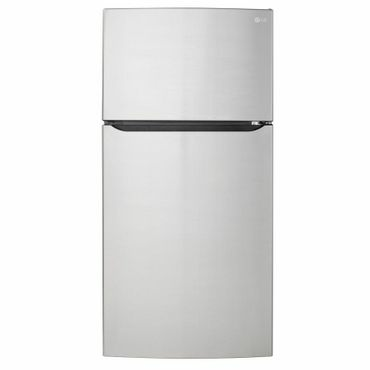 This model is the stainless version, it also comes in white as the LG LTCS24223W (Est. $1,100), black as the LG LTCS24223B (Est. $1,100) and black stainless as the LG LTCS24223D (Est. $1,200).